International employers who send staff based in an EU country to work in other EU countries on a temporary basis – whether within an international group of companies, or to a customer in another state - will be familiar with the Posted Workers Directive. The Posted Workers Directive provides a core set of employment protections to workers on international postings from one EU state to another (such as maximum working hours, minimum rest periods and wages and anti-discrimination provisions). It covers a wide range of situations: there is no minimum period so it can apply to an overseas posting of even a day’s duration in some circumstances. As a result, the implications of an international work posting can easily be missed by employers, with the risk of associated liabilities. Please see When does the Posted Workers Directive apply? below for more information on the application of the rules. Since the Posted Workers Directive relates to employment rights, breaches are most likely to come to light only if posted staff initiate a complaint. This may be relatively rare, given the temporary nature of postings to which the Posted Workers Directive applies. However on 18 June 2016 the Posted Workers Enforcement Directive (the “Enforcement Directive)” introduced new rules for cross-border postings which create more immediate issues for employers. 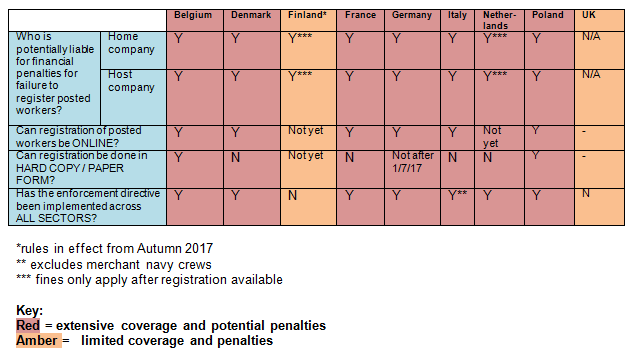 The new rules impose positive registration and documentation obligations on employers posting into most EU countries, with the potential for financial penalties for failure to comply. The effect of the new rules varies significantly depending which country staff are sent to. Employers posting staff into France, for example, face particularly onerous new registration obligations under the Posted Workers Enforcement Directive. Our article provides more details. At the other end of the spectrum, the UK implementation of the Enforcement Directive applies only to the construction industry, and imposes no new registration obligations. We have previously reported on the implementation of the PWED in the Netherlands, which lies somewhere between these two extremes. What does this mean for businesses who operate cross-border in the EU? Because the new rules under the Enforcement Directive vary from country to country, the risks to your business of cross-border postings depend on the destination country/ies to which you post staff. It will be important to track cross-border postings to analyse the extent of your obligations. The CELIA Alliance network can assist you with this analysis through our expertise on cross-border assignments across the EU. Please contact any member of the CELIA Alliance in the relevant jurisdiction for further information. Reminder: When does the Posted Workers Directive apply? Temporary agency work: an employment business in one member state posts workers to another member state.